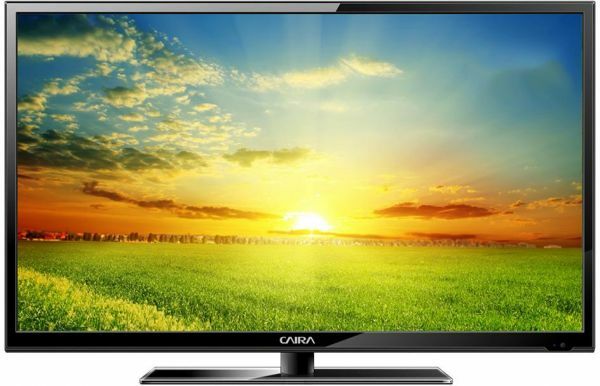 The Caira CA LD5240 40inch Full HD LED TV is your gateway to limitless entertainment. The set’s 40inch LED panel churns out spectacular 1920 x 1080 pixel resolution images that are just mesmerizing. The big screen is virtually bezel less, which lets you focus on the displayed images. The sound generated by this flat screen TV is just as impressive as its visuals. The LED flat screen TV also incorporates several interfaces such as two HDMI and two USB ports. You can connect your peripheral gadgets like game consoles, computers, DVD and BluRay players, etc. to these interfaces. The Caira CA LD5240 40inch Full HD LED TV’s massive 40inch LED panel renders spectacular 1920 x 1080 pixel resolution images that are lifelike. The sleek panel of this big screen TV has a refresh rate of 60Hz, which helps it generate smooth, blur free images. The Caira CA LD5240 40inch Full HD LED TV integrates several I/O ports that you expect in next generation television sets. It incorporates two HDMI, two USB ports, an earphone port, and more, for your convenience.